I know you have been just waiting inpatiently to see what this $2.00 piece of furniture was that I brought home from Value Village 2 weeks ago. Well, wait no longer. It’s a bench! I know it definitely doesn’t look like much now… but I don’t see the above picture when I look at it. I see the wood painted a soft white or a soft color and distressed and the top part recovered with some more batting and some fun fabric. It could even serve as an ottoman. I can’t wait to get started on it! And for $2.00 for a solid piece of wood furniture that will be a simple redo, I couldn’t pass it up. I stopped in Goodwill – the better one in my town – and found this wood J for $0.99. Hoping to incorporate it into a wreath. The wreaths were 50¢ each. And the glass pumpkin was $1.00. Got something fun planned for it which you will see in a later post. And I found another piece of furniture! This French provincial nightstand was $12. Again, couldn’t believe the price. I LOVE this style of furniture – have already redone 2 dressers like this that I use for entryway/console/storage. 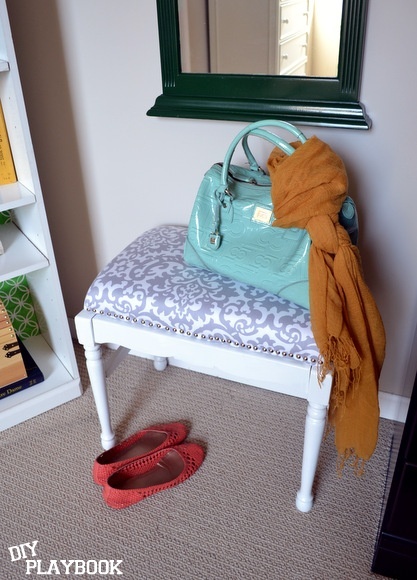 My entryway dresser redo post is here and my hallway dresser post is here. I was actually looking for 2 nightstands – 1 for the guest room, and 1 more for the master bedroom. And I want them to mix and match. This one was too big for the guest room so it will go in the master bedroom. I may try to salvage the top and stain it and then paint the bottom. Just have to see if it looks good enough to stain. So there’s my finds from 2 weeks ago! Not often that I find furniture those kinds of prices and to find two in one week was pretty amazing too! The Creative me and McG found all of this for $1.50 at a yard sale. Loving that vintage bedsheet! Jennifer from Decorated Chaos found some new lampshades at the thrift store a few weeks ago and then found a lamp too! Total for lamp and lampshade – $8.50. Love her decorated foyer table too. 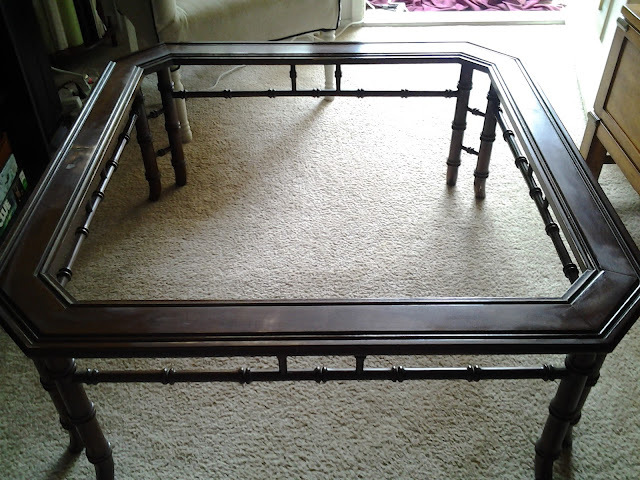 Marlin from Life between Potato and Rice found this bamboo coffee table (with the glass) for $20 at a thrift store. Can’t wait to see what she does with it. 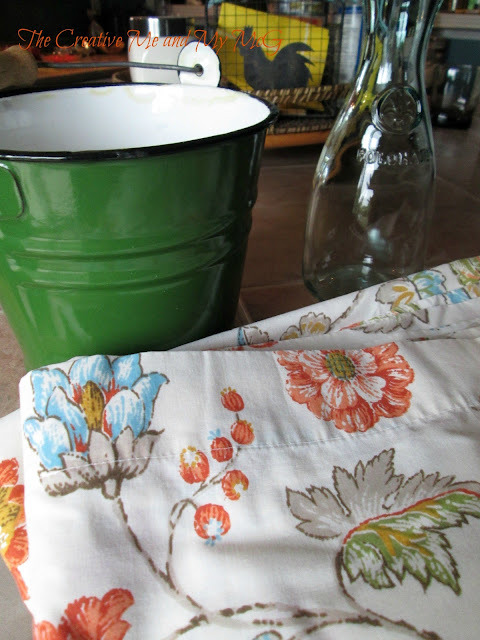 Have some frugal finds of your own to share? Link them up below and you just might see them featured next week. wow, great finds all around Ladies! Christina, great finds in the furniture. at my VV (called Savers here in NE), I often find unopened games and puzzles that are perfect for my grandson and nieces and nephews. Our price point is higher, but I usually have a coupon. They regularly give out 30% off ones if you bring in a donation. Recently got brand new King size PB duvet for $7.99 and new baby onsies for 99 cents each. My favs are two large (22 x 22″) duck down pillows with raw silk covers for $4.99 ea., minus 30%. Cheryl @ The Creative Me and My McG recently posted..Burlap – Have you Jumped on the Band-wagon? ?